I (and a lot of other coaches) often refer to this as a motorbike shape, simply because it looks like you are sitting on a motorbike. You're knees should be bent, your bottom should be poking out, just like you are sitting on an invisible seat. The point is to make sure that your knees are bent to absorb the force of your landing. Try jumping off low objects and landing in your motorbike (bending your knees when you land). Just don't go too high, your knees can only absorb so much force. 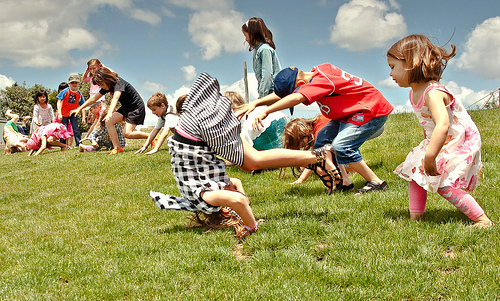 See our earlier article Teaching Children to Fall Safely for more detail. Best to do this outside on the grass, I wouldn't recommend trying it on wooden floor boards, make sure there is plenty of room around you. The easy version - simply lie down on the ground on your tummy, with your arms and legs stretched out in front and behind you. Lift your arms and legs off the ground. Roll sideways without letting your arms, hands, legs, feet, shoulders, or head touch the ground. Continue rolling sideways. Add a pause - Dish, 2, 3, 4, Superman, 2, 3, 4, Repeat... Above we started in a superman shape (balancing on our tummy). Here we start in a dish (balancing on our back). Lie down on your back, with your hands on your thighs. Pull your hands towards your feet, you need to have your head, shoulders, and legs off the ground so you are balancing on your lower back. Shoulders and feet should be about an inch off the floor. You should be able to feel your stomach muscles contracting. Count to 4, then roll onto your tummy (superman shape from above), count to 4, then roll over to dish. It starts simple, but after a while it will make your stomach muscles ache! A cartwheel involves rotating around two axis. Transverse for the entry / exit, and Anterior / Posterior for the actual cartwheel. To learn to do a simple cartwheel see this earlier article, but you can easily replace the box with any low object (just make sure it's stable). When you move on to trying it on the ground, make sure you face forward and start in a lunge (step forward with your left foot, bend your left knee, get nice and low, hands point to the left). Good for upper body strength. You don't need to go all the way up to a handstand to start, but you will be able to get higher as you get stronger. Use a wall where you don't mind repainting (or make sure you have clean feet) - only walk your feet up an interior wall, never kick up unless the wall is wood or brick (you don't want to kick a hole in the wall). Doors tend to have enamel paint which is easier to wash clean (but make sure the door is closed!). Squat down and put your hands on the ground (you may need to move your hands further out, or in depending on how good you are). Stop when you feel your arms getting shaky. If you can get your legs straight, then try and hold the shape for longer and longer. Make sure you are on something soft (trampoline mat, grass, sand, etc... floor boards hurt!). Never put your head on the ground! Your head is tucked in and you roll on either the back of your head or your shoulders. Stand with your feet apart in a star shape (it gets your center of mass closer to the ground, and stops you from kneeing yourself in the face when you are first learning). Tuck your chin in to your chest, you are trying to see the roof behind you (try to put your nose in your belly button works well too). Keeping your head tucked in, fall over onto your shoulders. Tuck and stand back up. That's all for now, I may add some video demonstrations later.